The best way to describe my initial impression of employee wellness company Zoojoo.be – named for the Tamil term “jujube,” or “it’s easy” – is Star Wars wrapped in a rainbow. While liberal use of color is not uncommon on startup websites, this one combines so many primary colors that it’s hard not to think of Superman – until you see the Stormtrooper helmets and lightsabers all over the place. Co-founder and CEO Avinash Saurabh is quick to tell me that he thought Rogue One had too many graphics that took away from the storyline. “It is a time of great turmoil, the overlords have attacked the (not so) secret headquarters of the startups,” the Bangalore-based company declares on its website. “But a ray of light arises, a New Hope. Zoojoo.be, the keepers of Imagination and the Force, have grouped with brilliant and creative troopers of the new age to fight the mighty empire.” You can almost hear triumphant march music playing in the background. One healthy habit equals one unit of happiness. “We are on a mission, and our mission is to measurably improve happiness in the world,” Avinash tells Tech in Asia. Through a mobile app, company employees can form teams and compete with the objective of building and keeping good habits. That can include drinking water, exercising, eating well, and spending time with family. Healthier and happier employees mean more productivity at work and better morale. Happiness doesn’t necessarily translate to sustainability, though. Avinash is quick to point out that giving out money could make someone happy in the short term, but Zoojoo has its eye on a longer-term outcome. The company quantifies happiness into units through a “non-scientific equation” – one healthy habit equals one unit of happiness. Its job is just to help people build it through mobile app games and friendly competition. Co-founded by Avinash and Anandraj Koormapolu, Zoojoo’s program currently caters to 150,000 employees across 22 companies in 10 countries, including India, the Philippines, the US, and the UAE. Mindtree, HP India, and HP Philippines are among its subscribers. The startup’s website. Photo credit: Zoojoo.be. The story behind Zoojoo might best be explained through, well, Star Wars. Its core team of seven – of a full-time team of 27 – is displayed on its website as a cast of characters from the story franchise, though they might not be the ones you think. Luke Skywalker is nowhere to be found, for example, while Avinash identifies solidly as Darth Vader. Why? Both had similar changes of heart in their career paths. A Jedi Knight of sorts in the corporate world, working for Robert Bosch Engineering and Business Solutions and manufacturing company Continental, he made his own turn to the Sith side of the Force. He became an entrepreneur, working with marketing, sales, and support. In 2012, he and Anandraj founded Zoojoo. 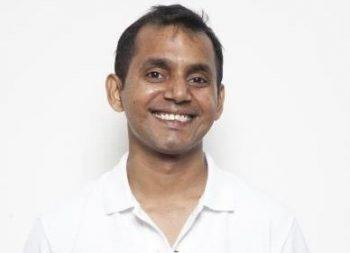 Avinash Saurabh, co-founder and CEO of Zoojoo.be. The startup was incubated for 18 months at the NS Raghavan Centre for Entrepreneurial Learning at IIM-Bangalore and raised US$1 million in 2015. That money helped the company obtain its own office. Through Zoojoo and corporate human resources departments, employees form teams of about seven people and compete to practice good habits. Through consultation with behavior science companies, and institutions like MIT Media Labs and IIM-Bangalore, Zoojoo’s team gained an understanding of behavior science and how to integrate technology – and positivity – with it. Avinash combined that mindset with the goal of making money, something that he says is much less difficult when people are already aware that there’s a problem. Corporate workers are stressed out, and hours behind a desk can lead to unhealthy habits. All he had left to do was provide corporates a solution. Zoojoo’s services are available for a range of prices that depend on the size of the company and its chosen payment plan. Employee wellness startups like Truworth Wellness have also taken to harried corporate workers for a steady, global userbase. However, Avinash admits that the future is uncertain – at the end of the day, Zoojoo’s just a company trying to solve a problem, grab some traction, and grow over time like everyone else. In the programs it already has set up, the prospects seem to be good. The company’s programs lessen the possibility employees taking sick leave. In an IIM-Bangalore study, participants reported feeling an average of 83 percent more energetic and 72 percent more connected to their colleagues. 70 percent of employees remain engaged with the program. It’s easy to confuse culture with fun – that’s not what it is. And though Zoojoo’s colorful website is abuzz with promises of job titles like “sales ninja” and “developing genius,” and promises of free food, Avinash warns to not mistake that alone as an indicator of a strong company culture. “It’s easy to confuse culture with fun – that’s not what it is.” Real culture comes from what he calls a “clearly defined playbook” – clarity in how the group acts, thinks, and grows together. That requires an individual to have passion and a sense of purpose. That said, Avinash admits the occasional screenings of Star Wars Episode IV: A New Hope – his favorite of the franchise movies – don’t hurt.